A misdemeanors court in Thessaloniki yesterday issued suspended jail sentences to 14 ultra-Orthodox monks who have been illegally occupying the Esphigmenou Monastery on Mount Athos since 2002 when they fell out with the Istanbul-based Ecumenical Patriarchate. The monks were issued with 1-year jail sentences, suspended for three years, after being found guilty of disturbing the peace. Two police officers, charged with breach of duty after allegedly allowing a vehicle carrying provisions for the rebel monks to cross into the monastic community, were exonerated due to a lack of incriminating evidence. A court has convicted a rebel abbot and 13 of his monks of obstructing the functioning of their 1,000-year-old monastery by refusing orders to leave it. Court officials in Thessaloniki said on Thursday the 14 were given one-year suspended prison sentences. The occupants of Esphigmenou Monastery are in a bitter fight with Orthodox Christian authorities. 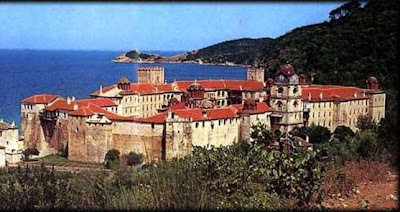 Ecumenical Patriarch Bartholomew I, spiritual leader of the world's Orthodox Christians, has declared them schismatic and ordered them out of the walled monastery on the autonomous Mount Athos peninsula in northern Greece. He is backed by an older eviction order from Greece's highest administrative court. The monks oppose efforts to improve relations between the Orthodox Church and the Vatican.